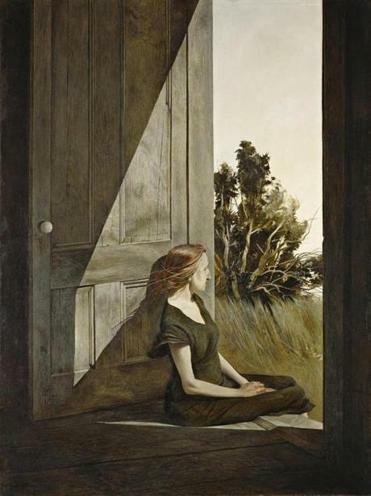 A detail of Wyeth’s “Christina Olson,’’ one of several works in which doors and/or windows are featured. HARTFORD ­— The people in many of Andrew Wyeth’s paintings look away. We see their backs, the edges of their faces. We cannot look in their eyes. They are small and solitary, and the world beyond them vast and somehow unreachable. 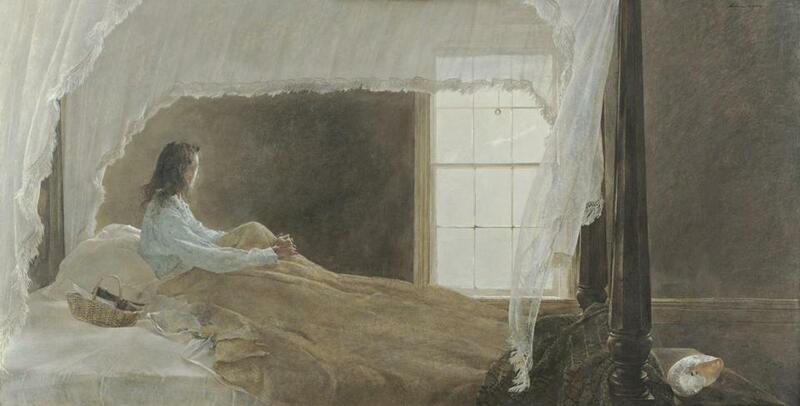 You can see it in “Chambered Nautilus,’’ one of a handful of Wyeth’s exquisite, gritty tempera paintings in a penetrating show, “Andrew Wyeth: Looking Beyond,’’ now at the Wadsworth Atheneum Museum of Art. The painting, made in 1956, depicts his mother-in-law, Bess James, confined to her bed. She sits up, bony hands wrapped around raised knees, gazing out the window, which is a sheet of pallid light. A nautilus shell glistens on a dull wooden chest at the end of her bed. With extraordinary precision, Wyeth captures the smallness of Bess’s world, the contraction of her days. Her stringy, unwashed hair suggests the depredation of illness. The nautilus itself is a metaphor for life's containment. Yet it seems to shine with its own light, as if even the most ordinary of lives is imbued with dignity and beauty. You only have to look to find it. Wyeth is a controversial figure in 20th-century art, of course. He didn’t hobnob in New York or kowtow to the art world. He kept to two small communities: Chadds Ford, Pa., where he grew up, and Cushing, Maine. Critics decried him as kitschy and anachronistic, but his work has been wildly popular with the public. He was anachronistic — a realist in a world of abstract expressionists, a painter of an America so rural it appears shorn of power lines and electrification. But Wyeth was no romantic. His paintings are keenly composed, technically dazzling, and trenchant. They are unsentimental in their reckoning with isolation and struggle. James Welling’s “End of Olsons,’’ after Wyeth’s painting of the same name. Wyeth has been, on occasion, anointed by the art establishment: His most iconic painting, “Christina's World,’’ was acquired by the Museum of Modern Art in 1949, the year after it was painted. Fans of Christina Olson, a regular model of Wyeth's in Maine, will be glad to find a portrait of her here, perched in her doorway in a cool slant of light. 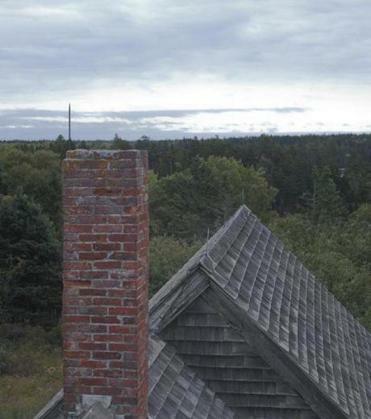 The Wadsworth snatched up Wyeth’s “Northern Point’’ in 1950, soon after he painted it. It’s a lean, exquisite work, a landscape painted from the vantage point of a lobsterman’s roof on Teel Island in Penobscot Bay, Maine. “Northern Point’’ and “Chambered Nautilus,’’ along with “April Wind’’ (1957), depicting a lone man seated on a fallen sycamore, all part of the Wadsworth's collection, form the core of this exhibit. Several studies and letters inform and expand upon the paintings. A watercolor study for “Northern Point’’ illustrates how Wyeth refined his composition in the final work, elongating the scene, muting the crystalline watercolors to his more familiar palette of weathered earth tones. Tempera is notoriously difficult to work with; it’s a dry pigment, it sets quickly. Wyeth made only a handful of such paintings each year, and he worked his way up to them with studies in pencil and in watercolor. The watercolors sport virtuosic gestures, pockets of luminosity, and vaporous passages that read like fever dreams, evident in studies of conch shells he made for “Chambered Nautilus’’ (he ultimately switched out the conch for the nautilus). Then there’s a pencil study for that painting, in which the artist gives great attention to a post at the foot of the bed, and to ties in Bess’s hair, but everything between is very nearly absent. In such works, we see Wyeth working bit by precious bit up to the final execution of the painting. His attention to detail hones our own. Erin Monroe, the Wadsworth’s assistant curator of American paintings and sculpture, fleshes out the exhibit with works in which Wyeth depicts doors and windows, including “Christina Olson,’’ with the flinty model in her doorway, seated because she was paralyzed and could not stand. These were a recurring motif, thresholds between the tangible and the intangible. “Andrew Wyeth: Looking Beyond’’ poignantly anchors us at the edge of beyond, with every other yearning human. Photographer James Welling grew up in Hartford and as a youth spent afternoons at the Wadsworth gazing at “Northern Point.’’ As a photographer, he's gone down many roads, exploring abstraction, documentary photography, light, color, and form. “James Welling: ‘Wyeth’ ’’ is his tribute to the painter, in a gallery adjacent to the Wyeth show. One of its chief delights is the reprise of many of Wyeth’s paintings. If you’ve ever visited Giverny to commune with Monet, or driven up to the Olson House in Cushing, which now belongs to the Farnsworth Art Museum, you’ll understand. Goose bumps of recognition. Welling is at the height of his own artistry, honoring the painter who prompted him along the path. He’s not strict in his re-creations; he couldn’t be. The landscape has changed. For instance, he scrambled onto the roof of the house depicted in Wyeth’s “End of Olsons’’ (1969), painted after Christina and her brother Alvaro died. The painting shows a cove beyond the house. Welling's “End of Olsons’’ captures trees that have grown since, and obscure the view. There’s something prayer-like about these photos, which also depict Wyeth’s studio. Welling uses the same nearly opaque white light Wyeth did. I particularly like the simplicity of Welling’s “Groundhog Day.’’ It revisits a mere detail of the original 1959 painting of the same name, a plain place setting on a table. That detail resonates with the spirit of Wyeth’s studies (including two for “Groundhog Day’’) in “Looking Beyond.’’ It’s as if the only way into the beyond is through the concrete.